Looking For a Great Italian Restaurant? 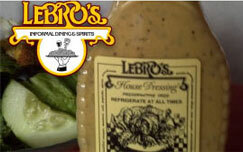 If you are looking for a great Italian restaurant and live in the Buffalo NY area, then Lebros is the place to be. Lebros offers a number of award winning dishes, and have become one of the best Italian Restaurants in town. Only a short distance from the University of Buffalo at Amherst, this restaurant has become a Western New York landmark for many reasons. A great Italian restaurant offering casual dining in a warm and relaxed atmosphere. Bring the whole family and enjoy the experience together. 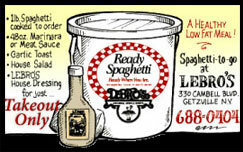 Our popular Ready Spaghetti is a healthy, low fat meal - ready for you to pick up and feed your family. 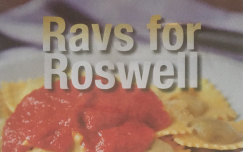 For every order of homemade Cheese Ravioli purchased at Lebro's Restaurant, $1 is donated to Courage of Carly Fund!